Christian leadership requires a combination of love, knowledge, intuition, and faith. It is strengthened by self-confidence, tempered by humility, and modeled on the conciliarity of the Holy Trinity. Although learning and study are important, pastoral skills are best learned through example and experience. Hellenic College Holy Cross seminarians develop these skills through daily participation in chapel services. They also participate in scheduled synaxes (community gatherings called by the President), service assignments, and other community events. In addition, all seminarians are required to participate in annual events both on and off campus. As future leaders of the larger community, seminarians must first show themselves to be motivated and responsible to the HCHC community. 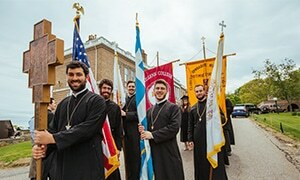 Studying and preparing to serve as ordained clergy in the Greek Orthodox Church requires two degrees: a bachelor’s degree (from Hellenic College or another accredited undergraduate institution), and (in most cases), a Master of Divinity (MDiv) degree from Holy Cross Greek Orthodox School of Theology. Undergraduate students who choose to attend Hellenic College as Religious Studies majors build a sound foundation of faith and learning and develop the intellect, skills, and moral compass to lead a Christ-centered life. Choosing the seminarian track allows students to complete one full year of requirements toward their MDiv degree as undergraduates, saving valuable time and resources. 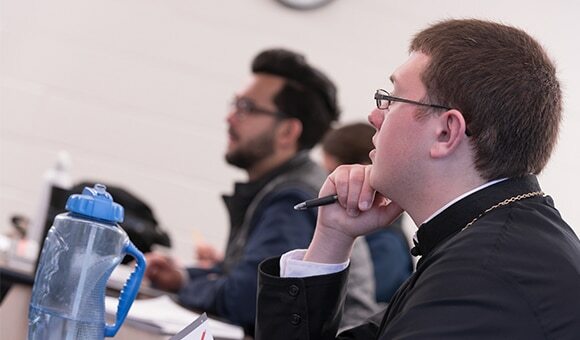 Seminarians enrolled in the MDiv program at Holy Cross learn to exemplify and articulate the Orthodox tradition in its pastoral, liturgical, biblical, patristic, dogmatic, canonical, ethical, and missionary aspects. They also develop the knowledge, sensitivity, and faithfulness to the Church’s liturgical life through daily worship. Upon successful completion of the first year of the Holy Cross MDiv program, and with the approval of the administration, faculty, counseling office, and spiritual fathers, students may acquire seminarian status and formalize their path to the priesthood. It is important to note that the completion of a Master of Divinity degree does not in itself constitute a guarantee for ordination. The decision of whether a candidate is eligible for ordination ultimately belongs to the ordaining hierarch. All students interested in the seminarian program must complete a separate application and other pre-admission requirements, including an assessment by the Office of Spiritual Formation and Counseling Services, which ensures a holistic approach to each seminarian’s formation. Participation in activities promoting spiritual and psychological formation and development are expected of all seminarians and seminarian candidates.